A version of this review previously appeared in Shelf Awareness and is reprinted here with permission. The 1995 bombing of the Alfred P. Murrah Federal Building in Oklahoma City, Okla., killed 168 people. When retired teacher and grandmother of six Wilma Melville showed up with her search-and-rescue dog Murphy, there wasn't much to be done. At the time, there was a woeful nationwide shortage of search teams--only 15, a fraction of what was needed. Knowing more dogs would save lives, Melville created the National Disaster Search Dog Foundation with an unspoken goal of certifying 168 SAR teams--one for each soul lost in Oklahoma City. 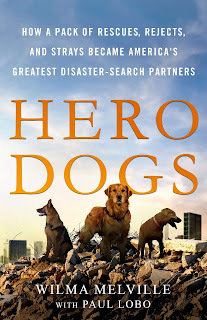 Hero Dogs: How a Pack of Rescues, Rejects, and Strays Became America's Greatest Disaster-Search Partners is the astonishing story of how one tenacious woman, helped by a legendary dog trainer and some willing firefighters, fashioned a three-dog pilot program that revolutionized disaster response. Without funding for selectively bred dogs, Wilma was forced to turn to the rejected and allegedly defective. Though she "[doesn't] exactly share their sense of humor," Wilma ended up with three golden retrievers--a twice-rejected guide dog that terrorized wheelchair users, an abused stray and a washed-out field trial competitor. With co-author Paul Lobo, Melville shares her story in straight-talking prose that evokes the tension and emotion reflective of the high stakes. She is also slyly funny, ironic considering her position on golden retrievers. When the pilot teams are thrust into the national limelight during their first real-life disaster on 9/11, the results are both triumphant and throat-closing. A fascinating read for animal lovers, thrill-seekers and rescue-hounds alike, Melville's work is proof that some good can rise from the ashes of catastrophe. STREET SENSE: Even as a lifetime dog lover, owner and trainer I was not really expecting to be as fascinated with this book as I was. It goes a little deep into training, but I don't think one has to be interested or proficient in dog training to "get it," particularly with the the stakes at hand. Despite Wilma's tough-as-nails veneer, she cracked me up regularly, intentionally or not. (For example: "So I did what anybody does when you need a meeting with one of the highest-ranking OES officials in the state--I kidnapped him.") This is one I'll keep on my shelf. 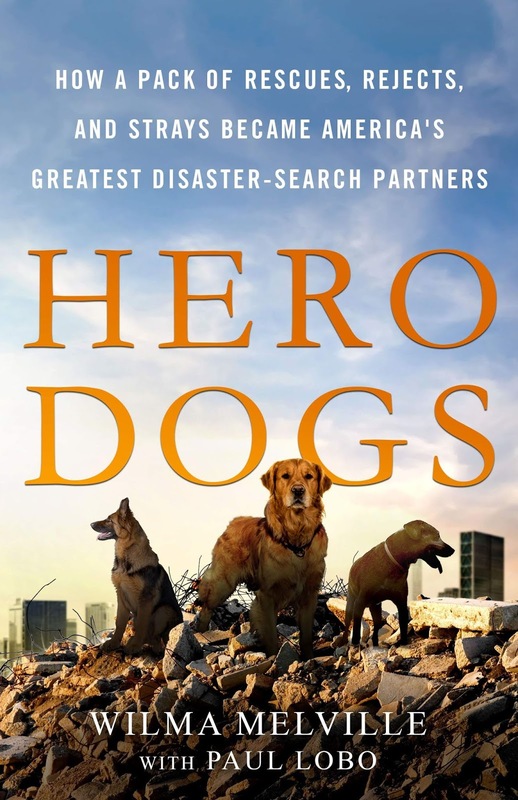 A FAVORITE PASSAGE: When they weren't searching, the dogs became the face of relief for the other rescue workers. They were the unofficial therapy dogs of Ground Zero. When you traverse a landscape of destruction for twelve hours a day, where everything wants to cut you and a misstep could mean serious injury, a soft, warm creature is a welcome sight. When your daily mission involves scouring destruction trying to find anybody alive, a friendly snout and a soul who will do nothing but sit by your side is more powerful than any medicine. The dogs provided hope and a return to normalcy. COVER NERD SAYS: I'm not sure how I feel about this cover, which probably means it lands in the category of "accurate and serviceable but the content called for more." I'm not sure there's anything about this image or the font to set the book off from another dog book. The rubble pile is dramatic, the dogs beautiful, but perhaps a more urgent skyline would have given it some pop. Despite the sometimes difficult subject matter, it is a story of hope and resilience, so maybe that was the aim. It's a solid cover, no doubt, I just wanted a bit more for these incredible creatures.